All necessary belay and protection pegs in-situ. Double ropes useful on the descent. 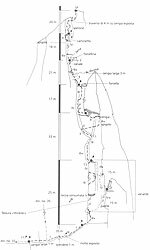 With their ascent of the corner system on the South Face of the Stabeler Tower, the two Saxony Sandstone pioneers Rudolf Fehrmann and Oliver Perry-Smith made the most strikingly obvious line on the wall their very own. 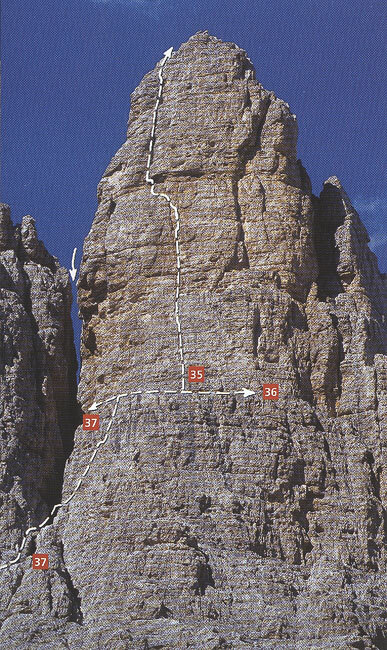 As part of the intégrale, this route forms the logical continuation to the “Delagokante” – the last abseil point from the Delago Tower is almost directly at the start of the Fehrmann/Smith. However, do not expect too much after your experience of the Delago – in terms of elegance, the Fehrmann does not even comes close. Approach as for the Delagokante as far as the terrace. Traverse this to the right to the Delago/Stabeler Cully. Alternatively start after the abseil descent from the Delago Tower. The start of the route is at the last abseil station (ring peg) in the Delago/Stabeler Gully. From here, climb up diagonally rightwards to the start of the corner system. 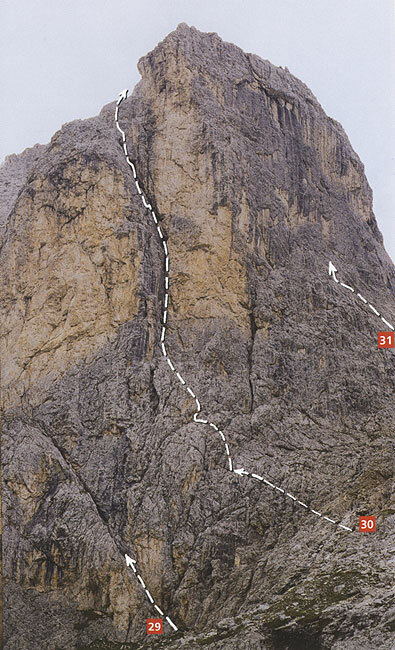 The route follows the obvious corner system of the South Face (120 m, allow 90 minutes). From the summit (cemented-in ring) abseil 25 m to a ledge (ring). Abseil over the south-east flank into the gully between the Stabeler and Winkler Towers (20 m, 20 m, 30 m, 25 m – cemented-in rings). Climb down easily over broken ground to the Gartl path; 1 hour. 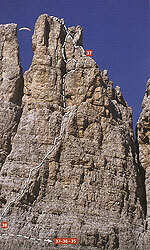 Those wishing to continue up the Winkler Tower will need to take a stance on the ledge at the last abseil ring. Many belay and protection pegs in-situ. 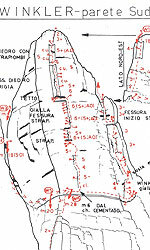 From the Rifugio Alberto, follow the Delagokante approach to the South Face and traverse right across ledges and broken ground to the Stabeler/Winkler Gully; 20 min. 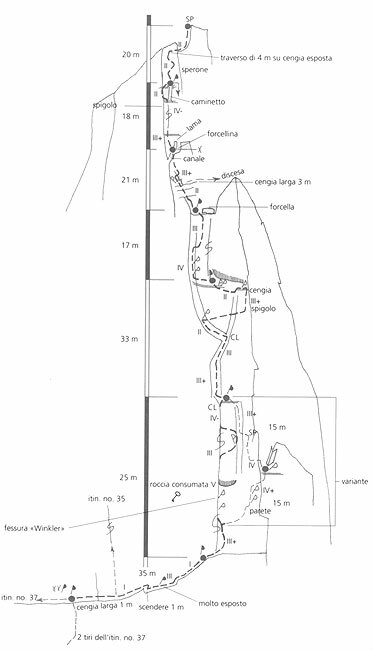 Alternatively, if descending from the Stabeler Tower, abseil to the ledge leading right to the start. Start at a chimney between the Stabeler and Winkler Towers. 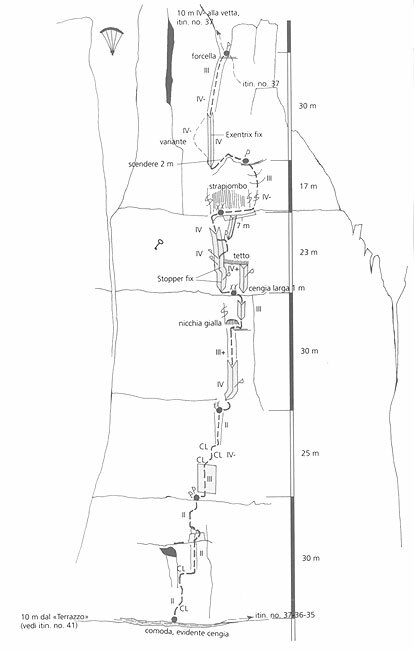 Follow this for about 50 m (II-III) to a ledge with a cemented ring peg (junction with the abseil “piste” from the Stabeler Tower). Follow the ledge round to the right (c. 50 m, exposed) to the foot of the Winkler Crack. The route uses the obvious South Face crack and chimney system to begin with. From the shoulder there are two possible variations: either climb the South-East Arête direct (the original, and easier, route) or the corner/groove system round on the East Face (more difficult); 120 m, allow 90 minutes. From the summit, climb down 10-15 m to the south-east to the ledge with the cemented-in peg on the original route. 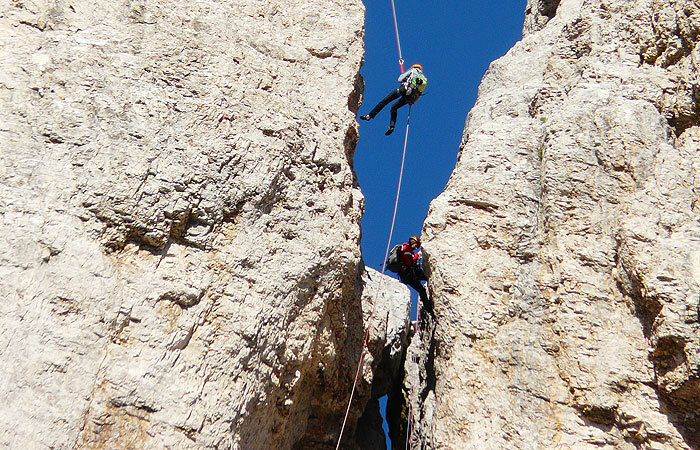 Abseil 20 m and then 15 m. Traverse west along a ledge on the north side – one short exposed section – to reach a further abseil ring. Abseil 25 m into the notch between the Winkler and Stabeler Towers. A further 25 m abseil will deposit you on the ledge which marks the start of the route. From here, abseil down to easier ground. Allow 45 minutes; all abseil rings cemented-in. First ascension: A. Bernard and M. Vigo 1991. This is an elegant and well visited itinerary, partly on compact surface. 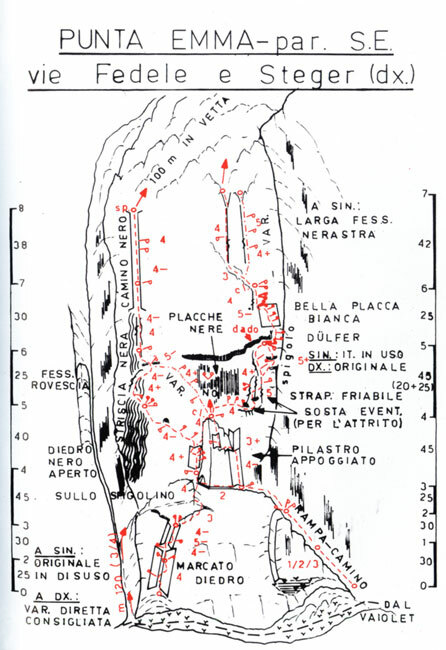 The end of the route provides two possibilities to reach the Main Peak: to enter into the graveled hollow (after the first part of the trail “Dall’Oglio”) and proceed to the summit or to climb the beautiful trail “Dall’Oglio”. 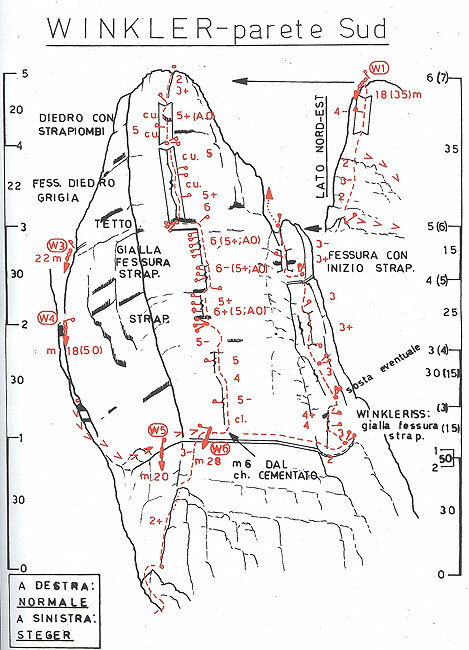 The combination of the routes “Fantasie” and “Dall’Oglio” is one of the most extended routes of the Catinaccio. Starting from the Refuges Vajolet and Preuss, 2243 m, ascend following the way n. 541 towards the Passo Coronelle. 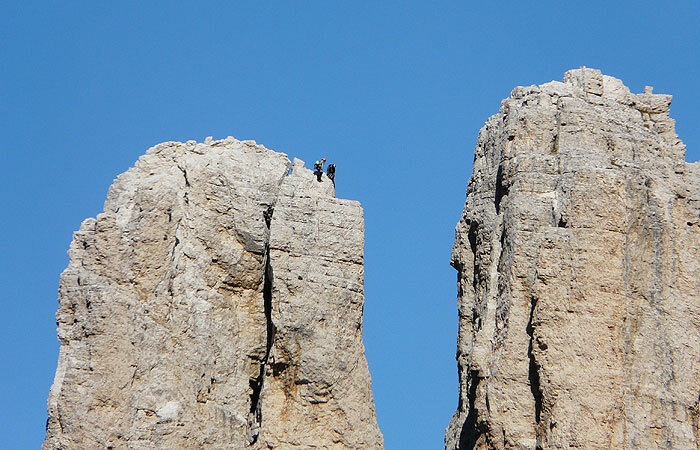 Turn to the right below the “eastern rock face” and in front of the “Diretta Steger” and walk along a green small valley leading in short time to the climbing approach. Duration: 40 minutes. 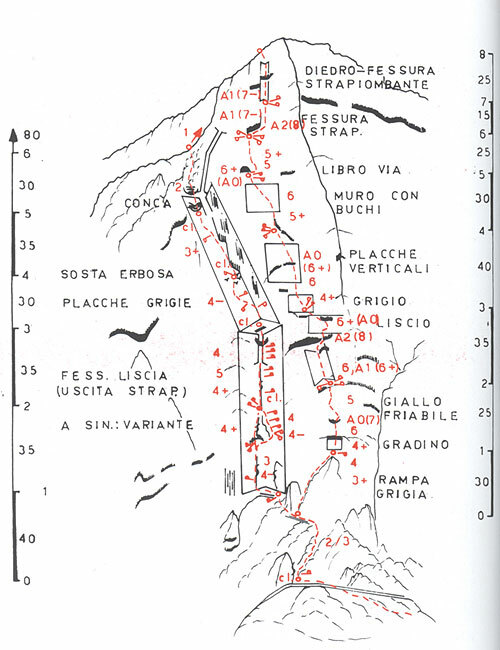 The Refuge Gardeccia can also be taken in consideration as starting point for the approach. 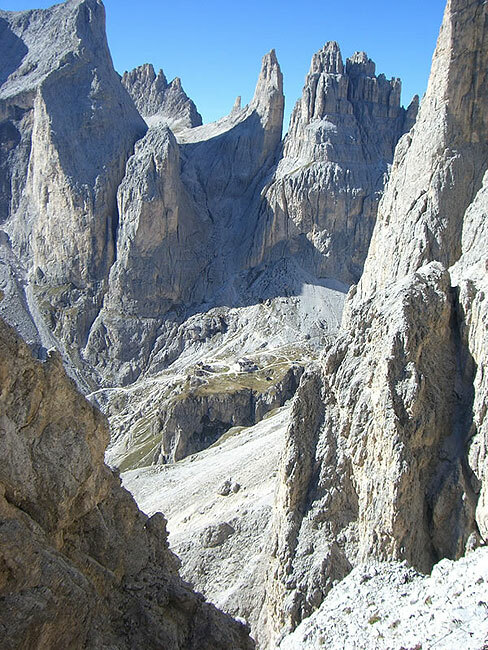 Climb to the Main Peak along the little treacherous graveled hollow and the southern ridge (I-II grade, 40 minutes) or following the beautiful route “Dell’Oglio” (III-IV grade, 2 hours). This is one of the most pleasant ascents of the same graded ones and is therefore much frequented. 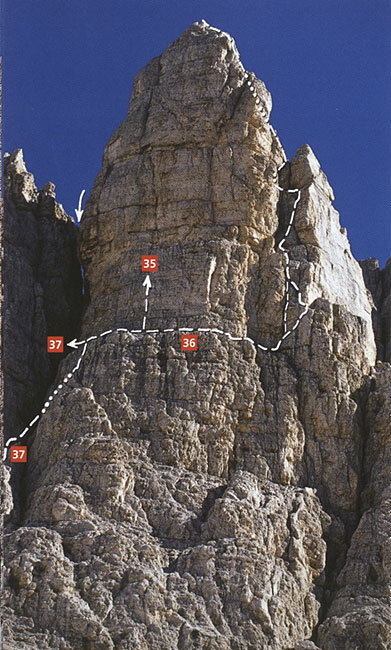 The direct climb is recommended, as it adds a breath to a route seaming short after reaching the attractive tract via chimney platform of the “Via Steger”. The original approach on the left side is mostly recommended. This itinerary is rich in variety, enjoyable and much frequented. The last four pitches are a lift up to the peak. 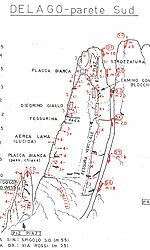 Like the itinerary n. 29, but continue along the hiking way under the “Punta Emma” to reach the approach. Duration: 15 minutes. From the mountaintop (stone pyramid) follow the crest towards the west and, near to its end, descend in northern direction (right) along the ledge for about 30 m of height difference (II grade). Then, behind the edge (on the left) descend for 15 m along a hidden ramp (NW, II grade). 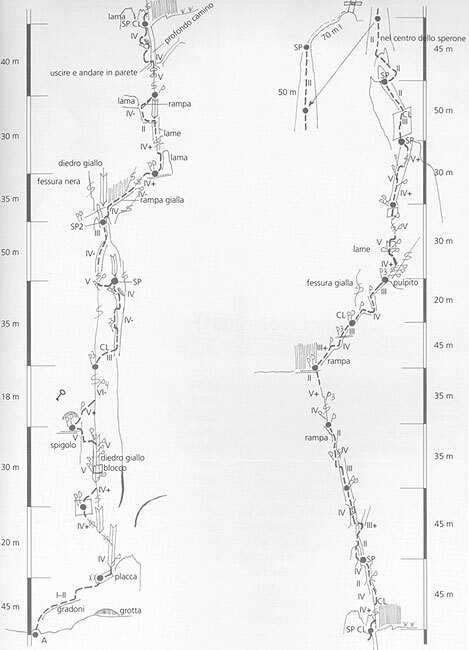 A cemented spike set little on the left helps to rope down for 25 m. Continue descending in the channel (NW, II grade) and turn to left before a leap and reenter below. Reach in short time the way n. 542. 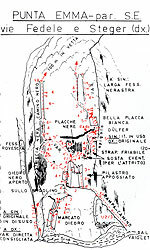 Duration: 30 minutes (1 hour to the Refuges Vajolet/Preuß). On the difficult pitches, all necessary belay and protection pegs are in place. It is advisable to carry a selection of slings and a few nuts in addition. 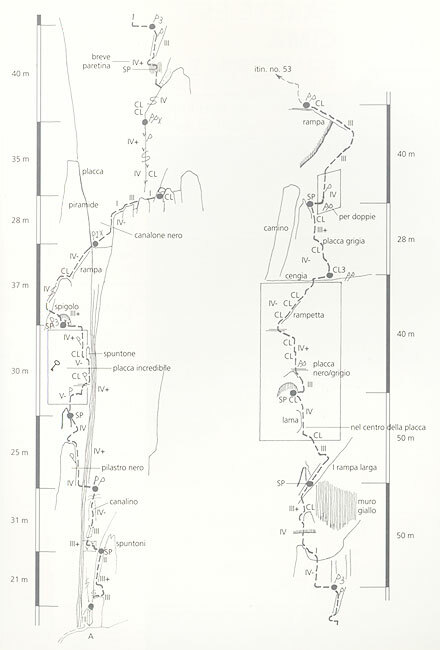 Tita Piaz, the first ascentionist of the Punta Emma, was also the first to climb the striking corner line on its East Face, a remarkable feat in the history of alpinism when one pauses to consider that he did the route in the year 1900, solo! 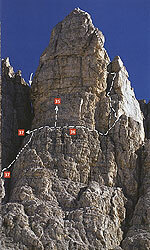 Nowadays the route is amongst the most popular in the entire group, due not least to the short approach walk. The difficulties in the corner system are concentrated into the second and third pitches. The impending chimney crack of the third pitch calls for a certain spiritedness and commitment; rucksack wearers seldom give a good account of themselves here! On the difficult pitches the rock is solid, although polished by the sweat of fear on the crux itself. Rifugio Vajolet (2243 m). 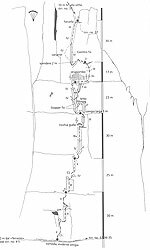 Reached on foot in ¼ hour from the Rifugio Gardeccia (bus taxi from Pera di Fassa) via a waymarked track. 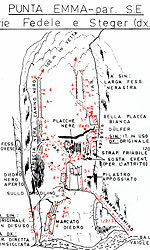 From Rifugio Vajolet, follow the path towards Rifugio Alberto/Gartl Hut until it is possible to traverse across debris on an ill-defined terrace to the foot of the obvious corner crack. Start at the obvious corner system just to the right of the fall line. Follow the corner system, exiting left onto a flat shoulder. Go west along the summit ridge and descend a gully between Punta Emma and the Rosengartenspitze to the “Gartl” path (two abseils). The “Delagokante” is one of the most celebrated of all Alpine climbs. As a result it is very popular – on summer days every stance is occupied. If this human route-finding system should fail, just follow the polished holds. 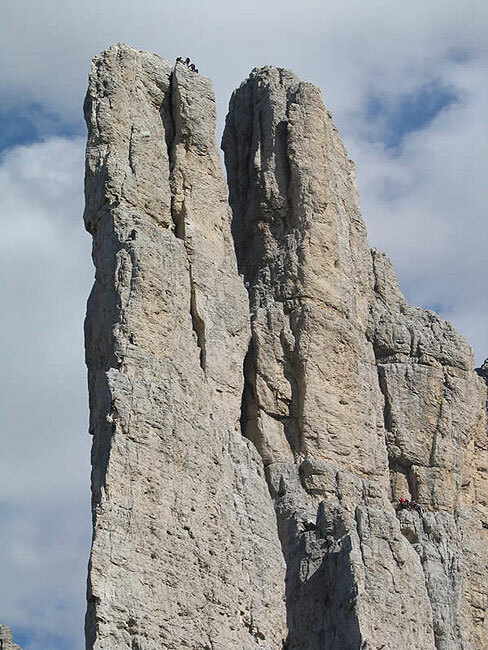 Despite its popularity, with such a magnificent position the climbing on the arête on little edges and flakes, cannot fail to inspire, from the first moves right up to the summit of the tower. First ascension: Hans Steger, Paula Wiesinger, Fred Masè Dari, Siegfried Lechner. August 1929. Belay and protection pegs in-situ on the difficult pitches. 50 m ropes needed. The walk up from Rifugio Gardeccia to Rifugio Vajolet is dominated by the broad and mighty presence of the East Face of the Rosengartenspitze. Twin col-like shoulders frame the Face, reducing the height of the wall on the extreme left and right hand sides and thus accentuating the big central lines all the more clearly. 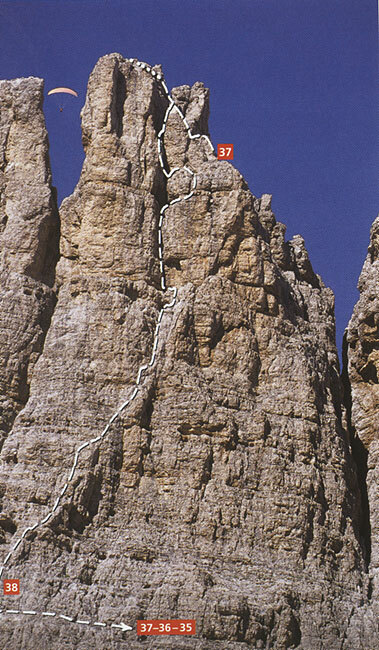 Hans Steger and Paula Wiesinger, the Dolomites first ascent couple of the 1920s, managed to climb the line of the wall: their route follows the parallel cracks splitting the East Face in the direct fall line from the summit of the mountain. 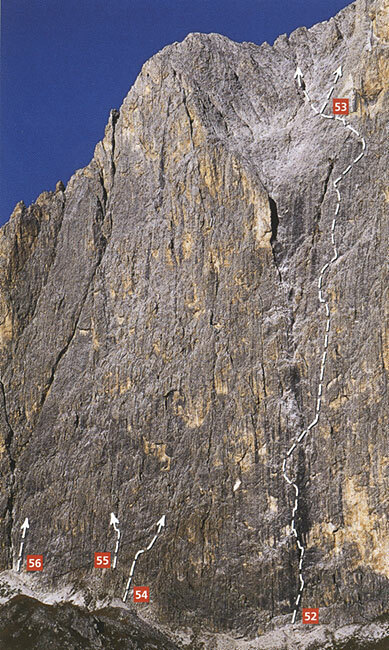 This long – and thus strenuous and sustained – route offers plenty of great, varied climbing, from the steep corner right at the start to the tricky yellow wall on the upper part of the Face. The rock is solid and those sections that traditionally have not always been too sound have cleaned up nicely over the years. Rifugio Vajolet (2243 m). Reached on foot in 45 minutes from the Rifugio Gardeccia (bus taxi from Pera di Fassa) via a waymarked track. Descend a short distance from the Rifugio Vajolet to a point where a signposted path branches off right to the Tschagerjoch. 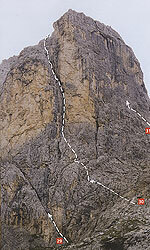 This leads under the Eats Face of the Rosengartenspitze. 45 minutes from Rifugio Vajolet; 1 ¼ hours from Gardeccia. The left hand of the two obvious cracks in the direct fall line from the summit starts life as a corner. It is reached from the left by scrambling over broken slab by ground. Follow the left hand corner and crack system at first. 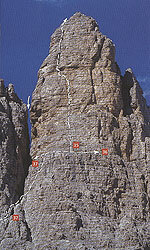 After the 7th pitch, the route swops over to the right hand crack system. Do not miss the turning ( a crack branching off to the right)! From the summit, descend the North Ridge to a notch; ring peg. 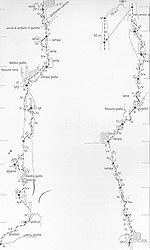 Either climb down (II-III) or make three abseils (20m, 50m, 50m) out of the notch to the west and continue down to the Santner Pass. From here, a path leads via Rifugio Alberto. (Gartl Hut) to Rifugio Vajolet. 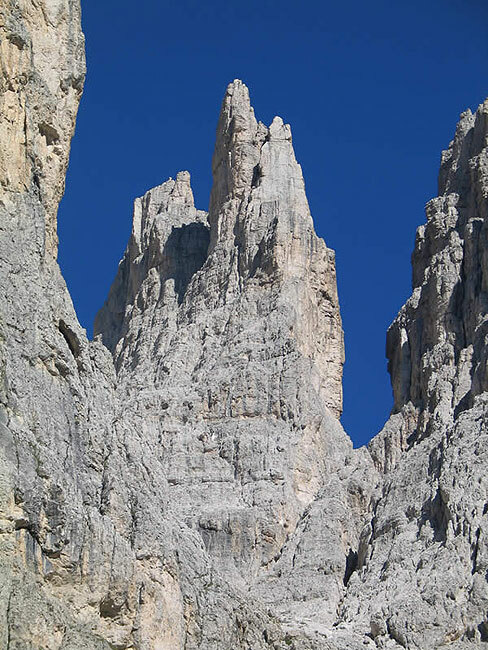 The Punta Emma was named after Emma della Giacomo who, with Tita Piaz, was the first to reach the summit of this peak in 1899 via the modern day descent route. 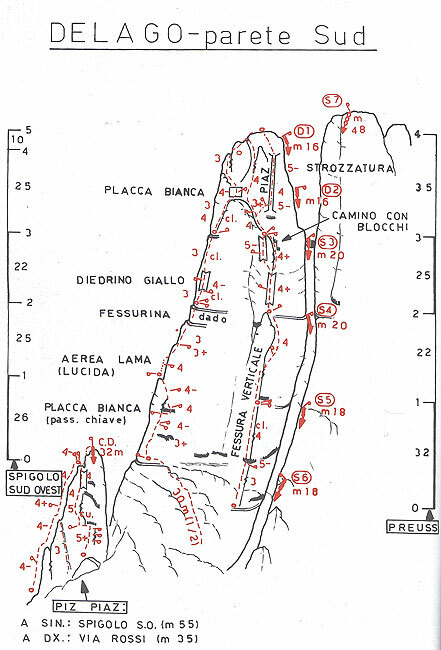 The Punta Emma is a favourite climbers’ objective, due in no small part to the short approach and the uncomplicated descent. 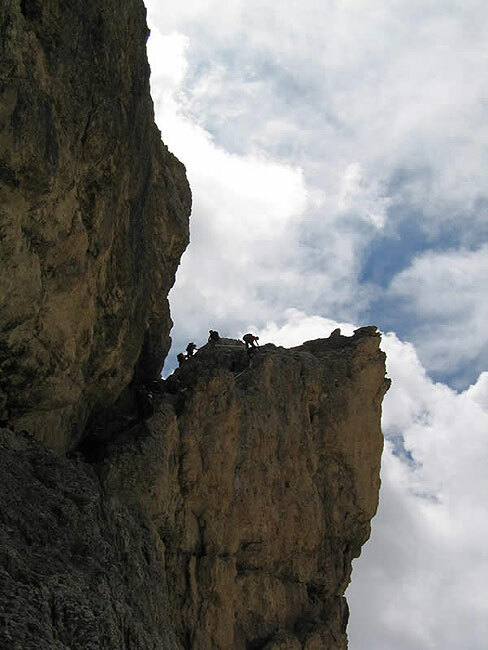 The route described here offers lovely and at times exposed climbing on solid rock. From the top of the first pillar the difficulties are continuous; however, the routefinding is not always immediately apparent. All necessary belay pegs and many protection pegs in-situ. From the Punta Emma, traverse across to an obvious ramp line. Start at the obvious ramp running up leftwards. Follow the ramp to its end and move left into a corner. Climb the corner to the top of a vague pillar. The obvious roof above is turned on the right. 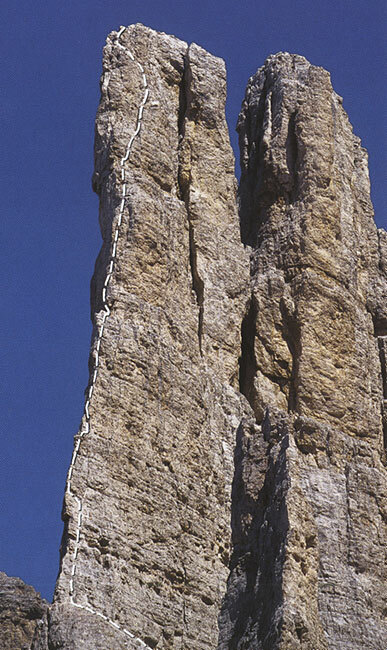 Climb a crack and corner system to join easier-angled rocks leading to the summit. From the summit, descend the ridge to the west for about 40 m (well trodden). Before the wall steepens, go left round the arête at a little terrace (cairn) and climb down and left – exposed – for a little way to reach a niche with a cemented-in abseil ring. 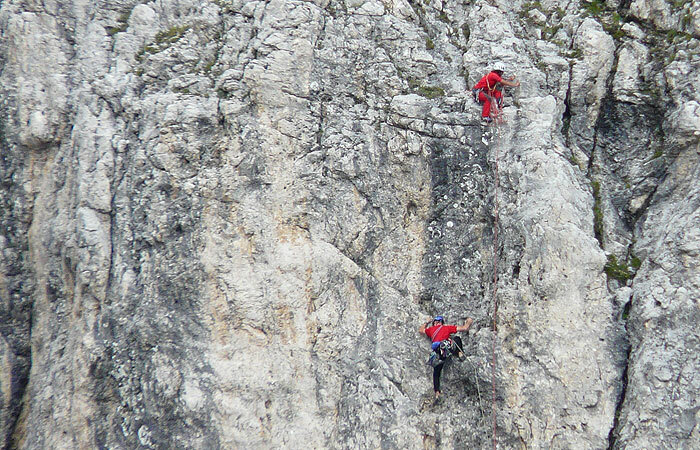 Make one 25 m abseil into the notch between Punta Emma and the Rosengartenspitze. Descend the right hand edge of the gully (full of snow, even in early summer) to the Gartl path (30 minutes). Plenty of belay and protection pitons. Take a selection of medium-size Friends or Hexentrics. 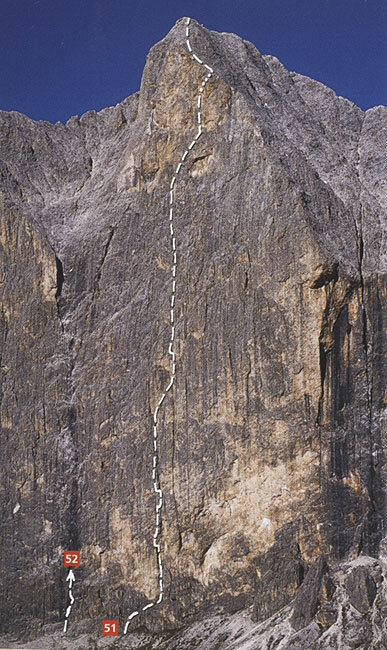 Only four pitches in length, yet in those four pitches Hans Steger and Paula Wiesinger needed to draw on their entire repertoire of climbing skills. 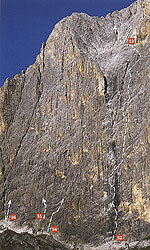 The first pitch awaits with lovely, steep face climbing on grey limestone. 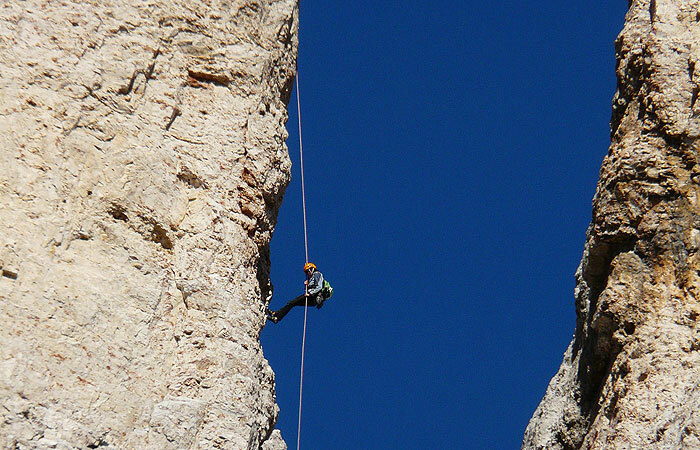 On the second, things get considerably more demanding: strenuous, vertical crack and face climbing on rock which is rather shattered in places. The third pitch is a classic “wooden wedge” crack; well equipped with a few Friends or Hexentrics, it is an absolute joy for crack climbers. 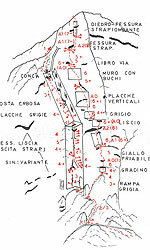 From Rifugio Alberto (Gartl Hut), follow the Delagokante approach to the South Face of the Vajolet Towers and traverse right across ledges and broken ground to the gully between the Stabeler and Winkler Towers (20 minutes). Climb the gully to the ledge at the start of the climbing proper. 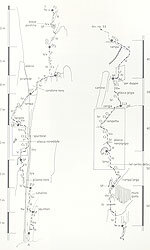 Alternatively, if descending from the Stabeler or Winkler Tower, abseil to the last abseil point on the ledge leading rightwards to the start of the route. Start on the ledge which runs rightwards out of the gully between the Stabeler and Winkler Towers at a thread between two cemented-in ring pegs. 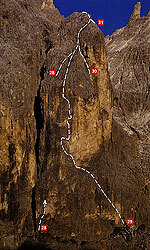 Climb cracks straight up the South Face (100 m, 2 hours). 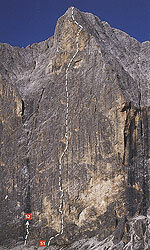 Descend as for the “Winkler Crack”.